When choosing compression gear it’s important to find a great fit that has been designed with the true movements of the human body in mind. This will help you to focus on performance in competition and training. One of my favourite features about adidas Alphaskin clothing were the strips of stronger material that help to give the items structure and provide a form fitting feel. This was especially true for the long tights that I trained in. The kinetic wrapped construction kept the tights in place exceptionally well, especially in the bottom position during weightlifting. Unlike traditional base layers, each section of Alphaskin is carefully constructed to match the body’s movements in sport. This removes unnatural friction between the fabric and the skin, and I was able to fully focus on the training at hand. I am currently working through a gruelling 20 rep squat program, and they were comfortable and supportive throughout every long set that I completed during my workouts. I also felt the enhanced support when working up to a back squat heavy single, as well with my Olympic Weightlifting session. 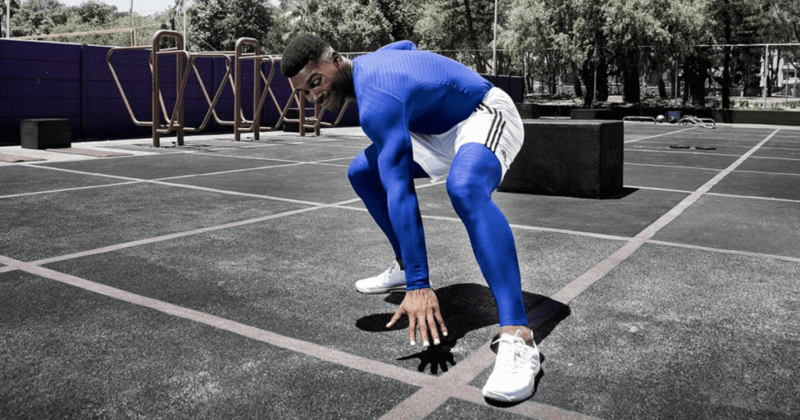 Rob Lee, Vice President of design for adidas Training explains this further: “We’re committed to creating only the best for athletes and that’s exactly what we’ve done with the disruptive design of Alphaskin. After taking a deep dive into their movements, needs and culture, we created a performance layer that keeps up with all of those elements. The 3 different compression grades allow you to select exactly what you need, based on what the garments will be used for. I wore the heaviest grade 360 long tights and long sleeve top, but you can also buy different gradings based on your preference. Take a longer workout involving wall balls and burpee box jump overs for example. When I completed this WOD, the Alphaskin Top helped to provide spring and support for holding and throwing the wall ball. The tights assisted in keeping my legs in an optimal position and ensured I maintained a strong movement pattern, even when I was fatigued. The thicker 360 Grade worked very well for me for lifting (as explained above) and for the aforementioned workout. Alphaskin’s highest compression for a locked-in feel. Flat, bonded reflective seams provide a distraction-free fit. Mid-level compression for a secure feel. Sleek design delivers a flattering, supportive fit. Features CLIMACHILL technology to keep athletes super cool and dry. Light compression for a supportive feel. Features CLIMACOOL technology to keep athletes cool and dry. I found this quote to be true for me as well. The support from Alphaskin gave me confidence and focus for each workout ahead. Take Snatching for example. I start sessions with breathing, then mobility and technique before loading the movement to build strength. Over time my body has become more naturally adapted to the mechanics. I felt I had a more solid, locked in feel when I wore Alphaskin, especially in the set up and catching position. The locked in, snug fit also helped me to concentrate on certain parts of my body as they moved. Here is the Senior Accounts Manager at BOXROX, Clemens Limberg, snatching is his Alphaskin. I often run an 8km route around a lake near Berlin and this was a great way to test how the tights fitted and performed for endurance style workouts. I generally find that I overheat when I run in compression gear. I swim in the lakes all year round to keep my body acclimatised for the cold water because I go on expeditions to places such as the Arctic to complete long-distance sea swims. These were the first compression garments that actually kept my body at a comfortable and pleasant temperature whilst training, and that was due to the CLIMACHILL technology that adidas has developed. When you look good you feel good, and that helps you to feel confident when you train and compete. Adidas have applied their traditional and iconoclastic aesthetic to the Alphaskin garments, fusing form and function into items that will help you perform and compete in style and confidence.